At $200, this headset makes a lot of sense. Oculus Go might be the virtual reality industry's best chance at pushing the medium into the mainstream. Tethered VR devices are unwieldy and generally require a beefy PC rig to run properly; mobile headsets offer a taste of what full, immersive VR has to offer, but they're limited by smartphone specs and battery life. Standalone headsets are the future of VR, and while the Oculus Go isn't the first device in this category, it's an accessible and high-quality option backed by the marketing power of Facebook. Oculus Go is a $200 headset rumored to hit the market at Facebook's F8 conference in May, but the company is showing it off, for the first time, on the GDC show floor -- and we've already gone hands-on. First up: the fit. Oculus Go is lightweight and comfortable, with three straps to adjust the size across the top and sides of your head. I have a remarkably tiny head, but with a few seconds of adjustment, the Go fit my face just fine, with the smallest gap along the bottom of the visor. This small window into the real world helped as I picked up the Go motion controller, and the gap disappeared from my field of view as soon as I jumped into an actual game. The controller is small, with a wrist strap dangling from the end, a trigger around the back, and on top, a touch-sensitive thumb pad and two buttons. As with the rest of the headset, the controller is simple yet effective, with little wasted space or unnecessary extras. The first game I tried on the Oculus Go was Anshar Online, a space shooter that uses the player's head motions to control a ship as it soars among interstellar debris and futuristic high-rises. Enemy vessels appear in the sky and the player's job is to shoot them down, aiming by simply looking in the direction they want to go and controlling the speed of the ship with the thumb pad. Slide your thumb up to boost and down to settle on a more leisurely pace (for a spaceship, that is). This is a control scheme that only works in untethered VR. The battles in Anshar Online break out all around the player -- behind, in front, up, down and sideways -- and with a wired headset, players wouldn't be able to swivel around without the fear of a cord unplugging or wrapping around their necks. When it comes to head-directed motion controls, untethered is the way to be. Anshar Online is a ton of fun and the directional tracking works exceptionally well. Whenever I missed shooting a passing enemy ship, it felt like a skill problem, rather than a tech issue. Anshar Online comes from OZWE Games, and it's heading to Oculus Go, Rift and Samsung Gear VR "soon." Apart from the single-player experience, the game supports up to eight players in PvP mode and five in co-op mode. And then there was They Suspect Nothing, a cute and quirky series of 12 mini-games about a human (that's you, the player) attempting to blend in with a world full of robots. If that premise sounds familiar, it's because developers took inspiration from the Futurama episode "Fear of a Bot Planet" and bits of Rick and Morty. They Suspect Nothing is done up in cartoony 3D, and it's packed with all manner of adorable robots. In one mini-game, I used the Go controller to direct a rolling metal friend across a field littered with traps and enemies, collecting power-ups and dropping them off in the appropriate portals. The Go controller works well as a motion stick -- it's accurate and smooth, allowing the tiny robot to pivot and dodge on command. 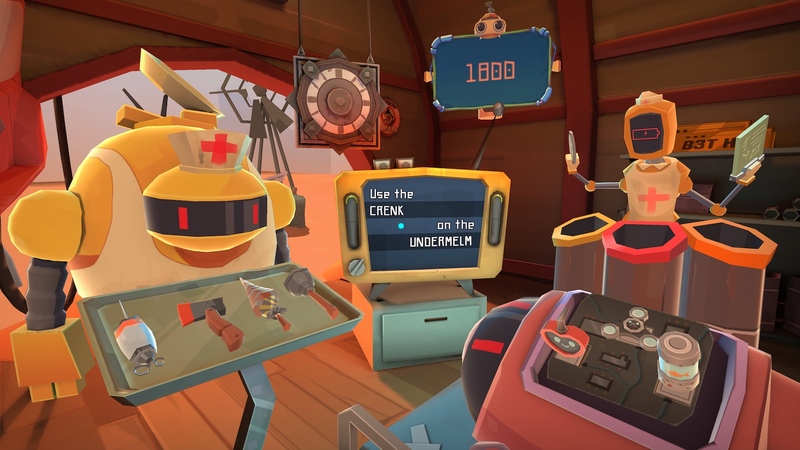 They Suspect Nothing comes from Gang Beasts collaborator Coatsink; it features the voice of renowned actor Jim Broadbent (he plays Slughorn in Harry Potter), and it'll be a launch title for the Oculus Go (whenever that ends up happening). Click here to catch up on the latest news from GDC 2018!